On Monday, experts with Scientific Analysis of Fine Art visited St. Olaf College to collect samples from what could be a genuine Edvard Munch painting. NORTHFIELD, Minn. -- For nearly 20 years a portrait of violinist Eva Mudocci has hung at St. Olaf College in Northfield. 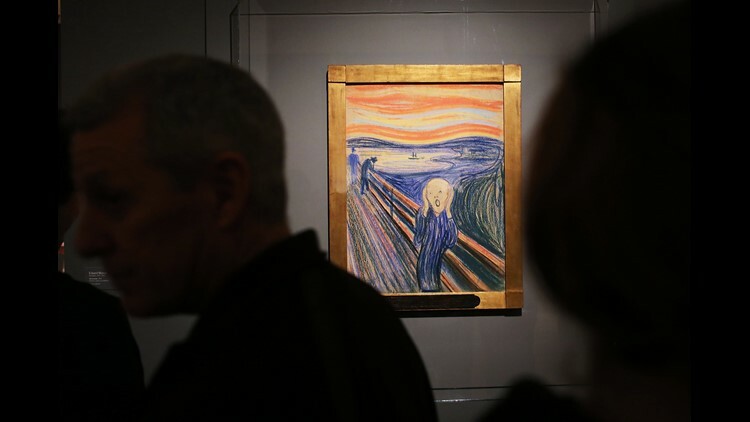 Now there's reason to believe it may be a genuine Edvard Munch painting. The Norwegian artist is most famous for "The Scream." A pastel version sold at an auction in 2012 for a record $119.9 million. The portrait of Mudocci was donated to St. Olaf in 1999 as part of alumni Richard Tetlie's 2,000-piece collection. "Up until recently it actually hung in the president's residence in the dining room above a credenza and President Anderson and his wife loved to talk about it at dinner parties and share part of the mystery of this story," said Jane Becker Nelson, director and curator at St. Olaf's Flaten Art Museum. Becker Nelson said at the time they had reason to believe it was maybe fake. But about a year and half ago, author Rima Shore contacted the college while writing a biography on Mudocci. 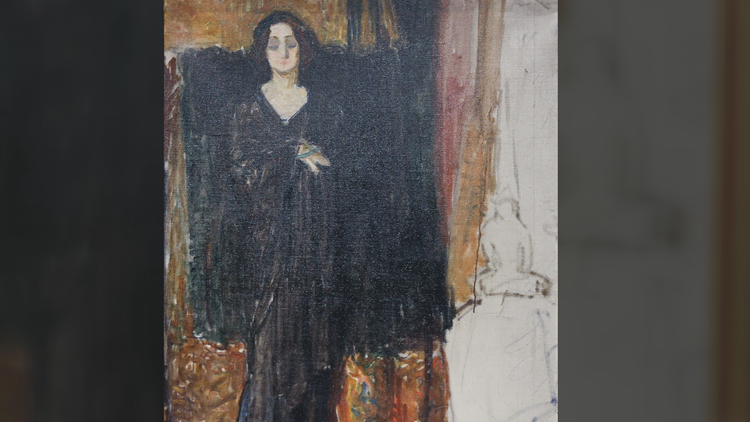 She spent a day on campus with the painting and staff at St. Olaf quickly learned more about the relationship between Mudocci and Munch. Her research revealed correspondence and auction records that corroborate the existence of this unfinished painting and helped fill in the holes of who has owned the painting in the past. A portrait depicting violinist Eva Mudocci. "He depicts Eva possibly in her apartment in Berlin where we know that they were together in the early 1900s and where we know he brought his easel, his paints, his brushes," Becker Nelson said. "We have correspondence that reveals they had a relationship, a romantic relationship, maybe at this time." Becker Nelson said they believe Munch may have painted it between 1900-1904. 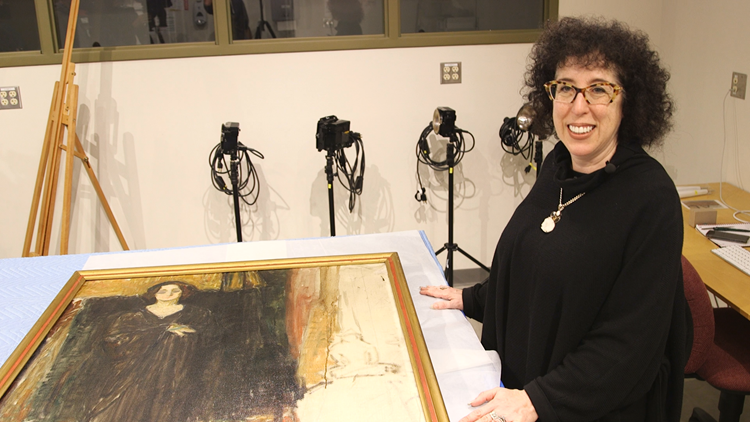 Monday afternoon, Jennifer Mass and Adam Finnefrock with Scientific Analysis of Fine Art (SAFA) visited the college to collect submicroscopic samples from the surface of the painting, behind the frame. The process will include x-ray fluorescence testing of paint colors with a spectrometer and a molecular analysis. "It's really exciting. I mean he's such a great colorist and we get an opportunity to study it," said Jennifer Mass, SAFA president. According to Mass, they will compare these pigments to more than 900 paint tubes owned by the Munch Museum in Oslo, Norway. "So we'll compare the chemistry in the paints of the studio to the chemistry of the paints that we see here... So we'll be doing a lot of pigment analysis and also looking at the degradation mechanisms that happen to paints after 100 years." As far as why the portrait is unfinished, Becker Nelson said there is speculation Mudocci was not happy with the rendition and that Munch was frustrated and gave up on it. "The canvas is actually still visible, as are graphite marks made by the artist," Becker Nelson explained. Those marks will be compared with Munch's sketchbooks. "Regardless of the outcome of the testing, our project with SAFA tells an amazing story of how science has incredible applications on the field of our history and how physics and chemistry, art history and art are really intertwined in the real world," Becker Nelson said. What if it isn't the real deal? Becker Nelson said, "I'll be a little disappointed. I'll admit it... but the process is a really exciting one." It will take about 6-8 weeks to get the results back. Becker Nelson said, if it is a genuine Munch, she does not know how much it could be worth. An event will be held Tuesday, Oct. 2 for those interested in seeing the painting and hearing from the SAFA experts. Munchs' Materials: How Science Informs Art History will be held at the Viking Theater, Buntrock Commons from 4-5 p.m. and will also stream online.